Summer is well and truly underway. I know this because I’ve planted some flowers in my front yard. The roses that survived the winter (four of five) won’t bloom for a few more weeks so I fed my colour craving with a swathe of begonias and violas. Red, orange, yellow: the cheery colours please me and feed my soul. My summer work schedule is going pretty well. I’m only behind by a day and a half from my original plan which isn’t bad. To-do lists of particular tasks combined with long-range plans do the trick of keeping me from panic. Tomorrow I have to purchase more canned cat food, book a check-up for the older dog and get rolling on a RESP maturity application as well as finish the unit on Achaemenid Persia for the correspondence course I’m writing. I’ll try to get more read in the M.A. essay I’m supervising which appears decent so far. Lurking ahead on the horizon is the task I really want to tangle with: more Old Bailey writing, and that is up next. All of those tasks are on the plan. All of that work will get done. But they’re not exactly deeply nourishing in a personal sense. Teaching preparation has an appeal, but I’ve found, over the years, that it’s not the best use of my time at the start of the summer so I’m resisting the urge to dive into my new course prep readings. 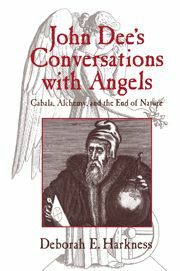 I have an alluring stack of books on ancient, medieval and Renaissance occult topics, including Deborah Harkness’s study of John Dee’s angelic conversations. These all need to sit and wait until after the Old Bailey article is in good shape because an article for publication trumps reading for teaching. In any case, it will be better for my teaching to complete the reading closer to the time I’m refining all of the course plans and better know what I need to know and teach. Right? Right! It’s funny but the prospect of my next research writing project just ahead feeds my soul as much as the begonias and violas in the flower bed. It may be a cliche that academics can’t tear themselves away from their research. I can and frequently do, but when a research topic gets me energized, I don’t want to wait! Soon, I won’t be waiting any more.